One of my favourite things to eat is the Chocolate Chip Cookie. I'm not partial to chewy or crunchy versions, and cravings can be satisfied either way. To me, a good chocolate chip cookie cannot be too sweet. It has to have the right balance of mellow sugars and flour. I am partial when dark chocolate is used, and will avoid the white chocolate ones (white chocolate is so. not. chocolate.). In my current favourite cookie recipe, I add oats more for its nutritional value than taste and texture. After all, you know, I got to sort of offset the (unhealthy) sugars with (healthy) oats - a good source of many good things, as you can read here. I like this recipe as it doesn't require a mixer, and it uses oil instead of butter. Both pluses in my books because of the convenience it lends to making of the cookies. When cookie-cravings hit, you just want things fast! I've made these cookies with various combinations of chocolate types, varying amounts of sugar, and different coarseness of salt. 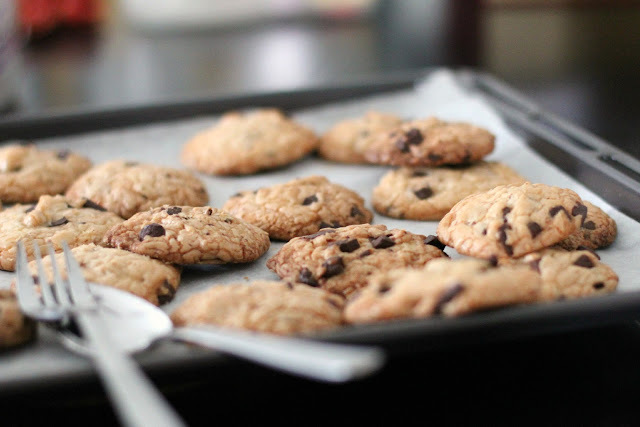 When sweeter chocolate is used, I reduce the sugars because I cannot stand too-sweet cookies. When I need to bake, I often just use whatever chocolate I have in the fridge, chopping them up into generous chunks. Thankfully, my brother-in-law likes to gift us with Ghirardelli dark chocolate bars, and I really like to use those with 60% Cacao. Coarser salt results in some bites being saltier and crunchier than others, making each bite somewhat of a surprise, and the overall experience of eating the cookie a little more interesting. This version is a treat for those who like salty-sweet desserts, and is a rather grown-uppy cookie, although Bubbles loves it too. Mix the sugars, oil, egg, and vanilla extract in a large bowl. In a smaller bowl, mix the flour, oats, salt and baking powder. Pour the ingredients from the smaller bowl into the large bowl mixture and mix well. Leave to cool in the pan for a minute or two, then move to a rack to cool completely. This sounds like my kind of cookie - I love biting into salt bits! I am partial to the chewy sort of cookie though. Ben's Cookies in Uk are still my all-time fav. Nice, Im gonna try this for a bake-event I volunteered myself for! And yes, using oil instead of butter is always a plus! I made some recently too! Definitely makes me feel a little less guilty. Thanks for the recipe! If you bake these ones for a shorter time, they do come out with chewy centers! I think it is the work of the oats. Oh yes, eating home-baked stuff makes me feel less guilty too. Although baking goodies also results in me indulging more!